This design enhances the utility of the ordinary bookshelf by providing shelving which requires no bookends or heavy-handed adjustments when a book is removed from the stack. It's simplicity also adds elegance without removing any previous storage or decorative capabilities. The bookshelf was also designed to accentuate the objects it held, and give a sense of lightness. Thus, the pieces were kept thin and the amount of joints were kept to a minimum. The flow of the wood grain continues from the angled sections to the horizontal, by use of an angled biscuit joint. To increase its modularity, the rest of the dado joints are held together with removable screws. In addition, the triangular book-rests are made of frosted acrylic so that a light source may be added to create an illuminating effect. Like the new site, Alex! Best of luck with it. 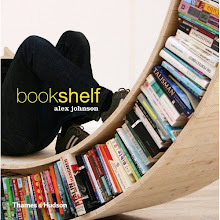 What a great idea to look at bookshelves. Still mystified though as to how you find the time to manage so much writing! Am in awe of your output. That's very kind of you. Hope the book is coming along nicely. Found your blog by way of ShedWorking. Many thanks for dropping by and glad you're enjoying this (and Shedworking too I hope! ).